In a high-stress, high-anxiety world, a serene life may feel like an impossible dream. But serenity can be consciously cultivated, if you are willing to make simple, life-enhancing choices. Finding Serenity in Seasons of Stress offers practical help that addresses the outward symptoms of stress and tension, and encourages you to examine the root causes, which are spiritual in nature. Author and spiritual teacher Candy Paull shows you how to: • tap into the wisdom of the body for healing and stress relief • explore spiritual practices that help you cultivate inner peace • bring your best to life for serenity at home and on the job • make empowering choices that honor your heart’s deepest desires • find courage and strength in the storms of life Discover an antidote to the frustration and stress of modern life and a deeper perspective on inner serenity. 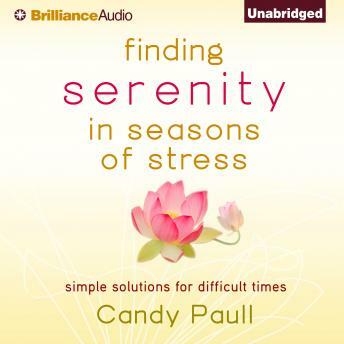 Finding Serenity in Seasons of Stress offers inspiring affirmations, spiritual insight, and practical tips for cultivating serenity in every season of life. Candy Paull is the author of The Art of Simplicity, The Art of Abundance, The Art of Encouragement, and more. As a freelance writer, Candy has owned her own business since 1990, specializing in marketing materials for book publishers. She frequently hosts retreats and attends speaking engagements in order to teach her audience to enjoy a more creative and abundant life. She is a published songwriter and performer who makes her home in Nashville, Tennessee. Visit Candy at www.candypaull.com.